Which type of fish to keep? Having fish as pets can be both enjoyable and fulfilling. There is the perfect tank and equipment to suit you, and with hundreds of species to choose from your tank can be completely unique. The best thing about fish keeping is that everyone can do it! There have been great advances in the equipment used to keep fish. You need less technical knowledge to run an aquarium and this means less time looking after the fish and more time to enjoy them. All that you have to do now is carefully choose the right fish store, and with trained staff and a complete range of products Petscorner is hard to beat. 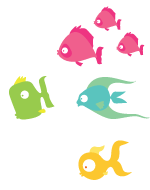 There are three main categories of fish that are stocked; Temperate fresh water, Tropical fresh water and Marine. These have differing requirements, so read on to find out which type will be most suitable for you. The best place to start for a beginner is with Temperate fresh water species, including Goldfish which now come in a myriad of different colours, shapes and sizes along with equally interesting names (Pearlscale, Black Moor, Shubunkin and Comet.) These fish are normally quite hardy and require less cleaning and maintenance than their Tropical and Marine counterparts. The majority of goldfish species are shoaling and prefer several other fish in the tank to swim with. They are mid water to surface feeders and are quite happy to take floating food from the surface. As the name implies, these fish come from warmer parts of the World and will require a heated aquarium. Their vibrant colours and exotic shapes and behaviour bring interest to any room. Tropical fish come from many river systems in several different continents; Africa, S.E.Asia and South America, so have preferences for varied habitats and water composition, especially pH (acidity). Fish that come from slow running water that has lots of rotting vegetation will need slightly acidic water; these include Rasboras, Tetras and most of the Barbs. Rivers flowing on limestone are alkaline and so fish that come from them prefer a different pH balance. Some specialist fish require a very precise pH and water chemistry, whilst changes in water chemistry, mimicking natural seasonal changes are needed to stimulate some species to breed. However, most of the popular species are not too exacting and will thrive in your tap water once the chlorine has been removed. These are the hardest fish to look after and require detailed research before starting an aquarium. Most are still unfortunately captured in the wild and are very difficult to breed in enough numbers to keep fish stores supplied. At Petscorner we do not stock Marine species for this reason. However we do still stock some of the equipment needed to keep a marine tank. Marine fish need the right levels of salt and ammonia in their water, they also need the constant maintenance of other chemicals in their water to survive. Many of them also require complex food such as coral polyps or sponges and some eat coral itself. Subscribe to our mailing list to receive updates on all things Petopedia.